Configuring the wireless settings is important when connecting wireless devices to your Wi-Fi. This prevents other individuals from connecting without permission. IMPORTANT: Some web-based setup pages may appear different. For more information, click here. On a computer that's connected to your router, launch a web browser and enter “192.168.1.1” in the Address bar then press [Enter]. Enter your login credentials in the field(s) provided. The default password is admin. If you have changed or personalized your password, use that instead. In the router’s Setup page, look for the SSID. If it is still set to linksys, change it to something unique and make sure that the SSID Broadcast is on the Enable option. Set WEP to Mandatory then click the WEP Key Setting button. In the window that opens, enter a Passphrase then click on the Generate button. If WEP is set to 64Bit, take note of the number in the Default TX Key drop-down menu. The number determines which Key (1-4) will be used. 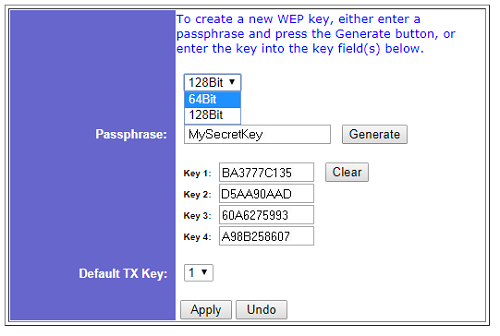 In the example shown below, the hexadecimal values in the Key 1 field will be used as your WEP Key. 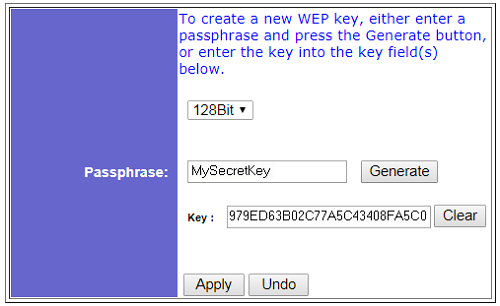 If WEP is set to 128Bit, the string of hexadecimal values in the Key field will serve as your WEP Key. 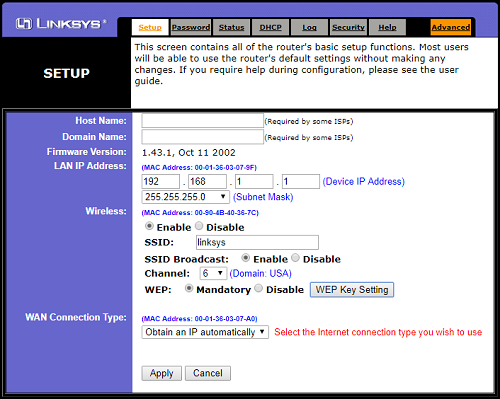 You should now have successfully configured the wireless settings of your Linksys BEFW11S4.